Wireless Terminal Solutions’ portable card terminals have revolutionised ways of accepting credit card payments. Our portable card machine and Bluetooth solutions are all compatible for accepting contactless and Apple Pay. With Wireless Terminal Solutions’ portable card machines, you can take the card processing terminals to the customer, quickly and efficiently. WTS’ portable credit card machines can be carried to any location within its range. The point of sale card machines provide greater flexibility, allowing card payments to be taken anytime, anywhere. Our portable debit card machines are perfect for use in bars, restaurants, sports clubs, hotels and nightclubs where portable card payment is required. 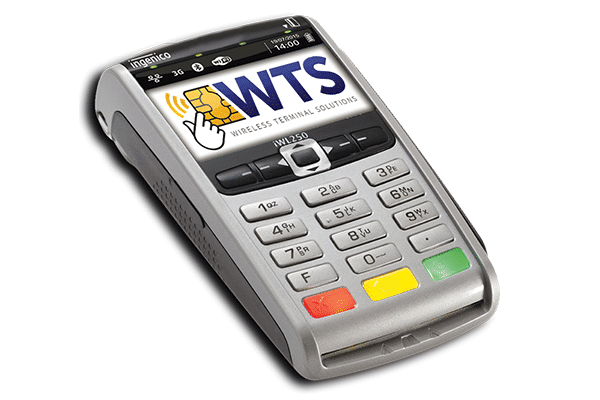 At Wireless Terminal Solutions, we are proud to be market leaders in supplying portable card machines on a short term or long term basis. Our Portable debit card machines are designed to be used wirelessly anywhere within 100m of the hub. It only needs one internet connection, so you can connect multiple card processing terminals simultaneously. The Ingenico IWL252 terminal also has contactless functionality allowing a faster credit card payment experience, improving customer service. The Ingenico IWL252 chip terminals also boast an outstanding battery life, allowing you to process up to 650 credit and debit card transactions on one charge. Our portable card machines are PCI approved and offer the latest security features. The swipe card machines are cost effective, easy to use, robust and come with a quick set up. Every portable Chip and PIN card machine supplied by Wireless Terminal Solutions, comes with simple instructions and ongoing technical support. Wireless Terminal Solutions’ unrivaled technical support is available online, over the phone and in our Surrey offices. We are also contactable via our social media. Our dedicated in house team will set up your portable card machine before it leaves us, so that all you need to do is connect the portable card machine to a phone or broadband line and switch it on. If you would like to learn how a contactless portable card machine can help benefit your business, please contact us, or call 0845 459 9984 where we have a dedicated team ready to assist. Wireless Terminal Solutions have a comprehensive range of accessories available for your portable card terminal. Have your card processing terminals charged and on display at all times to maximise payments. Don’t run short of paper rolls at peak times! Check out our thermal till rolls, holsters, and mounting arms. All of the accessories that Wireless Terminal Solutions offer, are available for next working day delivery if ordered by 1.00pm. If you can’t find the product you are looking for, please call a customer representative on 0208 669 2103 or email sales@wirelessterminalsolutions.co.uk. FAQs About Portable Card Machines? How does a portable card machine connect? What are the advantages of a portable Bluetooth card machine? Will my portable Bluetooth card machine work in an event setting or exhibition? At what range will my portable Bluetooth card machine connect away from the base station? Where are the portable card machines most frequently found? Does my portable Bluetooth card machine connect via internet or phone line? Does my portable Bluetooth card machine accept contactless payments? What is delivered with my portable Bluetooth card machine? Will my portable Bluetooth card terminal work abroad? Are Portable Bluetooth card terminals available to rent? The portable Bluetooth card machine works via Bluetooth, which communicates with a central hub that is connected to your phone or broadband line. You only need one PSTN or IP line, which means you can have multiple portable card machines connected to it. If your business has a fixed communication line (such as a broadband connection or phone line for example), a portable Bluetooth card terminal will provide your business with great versatility when you need to accept card payments away from a fixed location. Yes in most cases. We always advise speaking to the I.T team at the exhibition for advice. If you need additional support please contact us. One you have the portable terminal connected to the base station, it can then be carried to any location within its 100 metre range. Portable card terminals are particularly popular in the hospitality industry and are frequently used by bars, cafés and restaurants. They are perfect for a business that operates a pay at table service. The portable Bluetooth card machine has dual connectivity and can connect via IP and PSTN. Yes, all portable card machines supplied are contactless enabled. You will receive the handset, base and charger and two till rolls. In some cases we can provide an ethernet cable but we always request customers state this at the time of ordering and this is subject to availability. Yes a portable Bluetooth card machine will work internationally. They are available to rent from as little as one day. Providing you have a merchant account, we have most customers set up with their portable Bluetooth handset in 2 working days.